For those looking for the ultimate statement in outdoor decor, the Fonthill Fountain in Basin is a four-tiered centerpiece made to draw about the epitome of distinction and sophistication. The cast-stone Fonthill Fountain in Basin weighs 3761 pounds and displays a never-ending cascade of water for all to see. 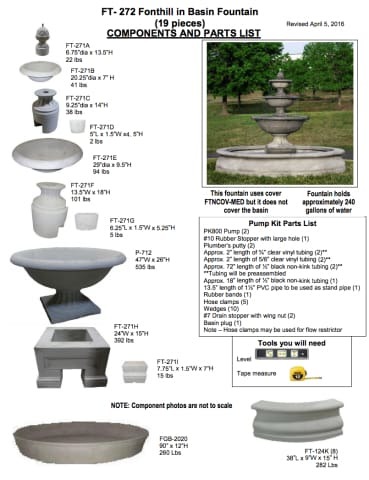 For a detailed step by step assembly guide of the Fonthill Fountain in Basin, please call our Team of Garden Fountains experts at 1-877-780-6699 for assistance. The Fonthill Fountain in Basin is 78 inches tall, 104 inches in diameter, and weighs 3,761 pounds. All Campania International pieces are stained to order. This process takes 10-14 business days to complete and to prepare for safe shipment. Order the Campania International Fonthill Fountain in Basin with free curbside delivery to your home from TheGardenGates.com today.